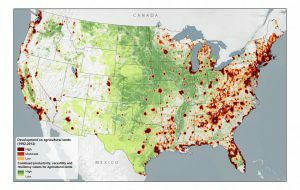 Climate and Agriculture in the Southeast | How Much Farmland Are We Losing to Development? How Much Farmland Are We Losing to Development? Every year a little more farmland is converted to development. In some areas, the conversion is a bit more rapid. This map from Modern Farmer shows how much land has been converted from farmland to urban uses between 1992 and 2012. Note how much of the Southeast is being converted, especially in areas surrounding big cities like Atlanta. Changing land use also changes the local climate, adding more heat to the system through increased pavement and reduction in trees. The water cycle also changes because water runs off instead of infiltrating into the soil. Read more at https://modernfarmer.com/2018/05/10-numbers-that-show-how-much-farmland-were-losing-to-development/. 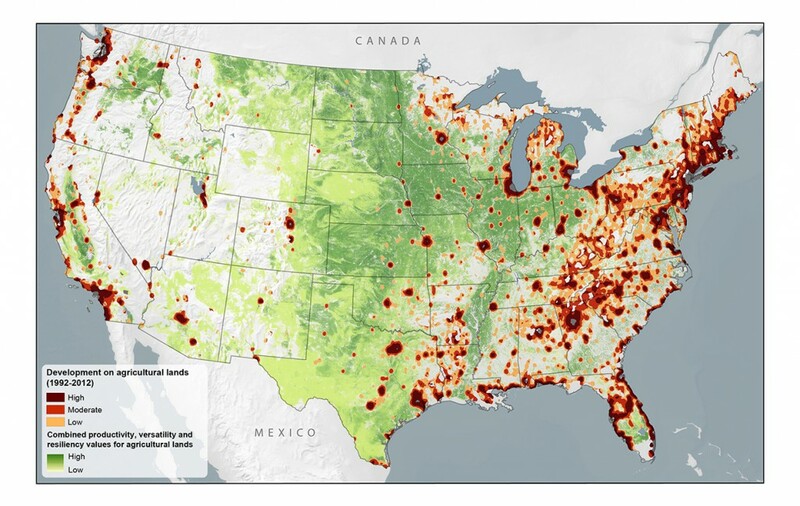 This image, courtesy of American Farmland Trust, shows the conversion of agricultural land to urban and low-density residential development between 1992 and 2012.